Undertaking any renovation project or building a new home can be daunting and requires making a lot of tough decisions. We provide both the roadmap and the vehicle to help you transform your new kitchen ,bathroom or other joinery. At Sublime, we pride ourselves on providing not only innovative and unique spaces but also an experience that will have you enjoying the process of creating something new. Our unique consultative design service offers the opportunity take a 3D Virtual Tour of your next kitchen and bathroom prior to commencement. Embark on the journey to your next your kitchen and bathroom with confidence in your final selections and design. The cost of a 2-hour onsite Consultation (Brisbane Metro Area) one on one appointment with Kim is $290. Kim’s friendly Design Assistant will ask you a few questions about the scope of your project and make an appointment to meet to discuss your project at your home, in our studio or at your Architect/Building Designers office or alternative location. Upon making an appointment, we will be send you a Room Profile to complete (if possible). This profile is designed to assist you with things you may not have thought of in regards to your renovations and will assist to develop a brief for your project. During your initial 2hr meeting with Kim, he will want to hear about how you live in your home and your objectives for the space to be designed. He will then give you some ideas on what he thinks could be achieved. Below are just a few of things he will consider before making recommendations. After your initial consultation , you will be given the opportunity to digest Kim’s thoughts and ideas. AT THIS POINT – THEIR IS NO OBLIGATION TO PROCEED WITH A FULL DESIGN. NOW THAT YOUR INTIAL CONSULTATION IS COMPLETE and we have determined your brief and project requirements we will send you an Authority To Proceed. This design agreement outlines our design fees, payment schedule and a time frame for design delivery. Your Initial consultation fee of $290 will be rebated off the above price once your design is complete. Our design fees are based on a 3 meeting consultative design process. CAN I BOOK MORE MEETINGS ? If you feel the need for more than the 3 x 2hr Meetings included in our design fee. We certainly can schedule more 2 hour meetings for an additional cost of $290 per meeting. At every meeting you will be able to view your proposed kitchen or bathroom in full 3D colour. Once your design is complete and your design fees are paid in full, you will receive. DO I RECIEVE WORKING DRAWINGS ? Detailed Full working drawings can be provided at an additional cost. Generally we only provide detailed working drawings with full Measurements, if you choose Sublime Architectural Interiors to manufacture your project. DO I RETAIN OWNERSHIP OF DRAWINGS? This way you can choose to take our drawings/design to seek costs from other firms or continue the journey with Sublime Architectural Interiors to fully cost, manufacture, install and manage your project. AT THIS POINT – THEIR IS NO OBLIGATION TO PROCEED WITH SUBLIME TO MANUFACTURE. Now that we have met with the trades on site and discussed any issues with the proposed implementation of the design, to be able to develop a fixed price for you we now need to confirm selections.Now its time for a bit of Homework. After presenting the final costings and making any adjustment to the design, materials or fittings to meet your budget expectations. It is time to sign off on the following Contract Documents. Final Plans for you to review and sign off. 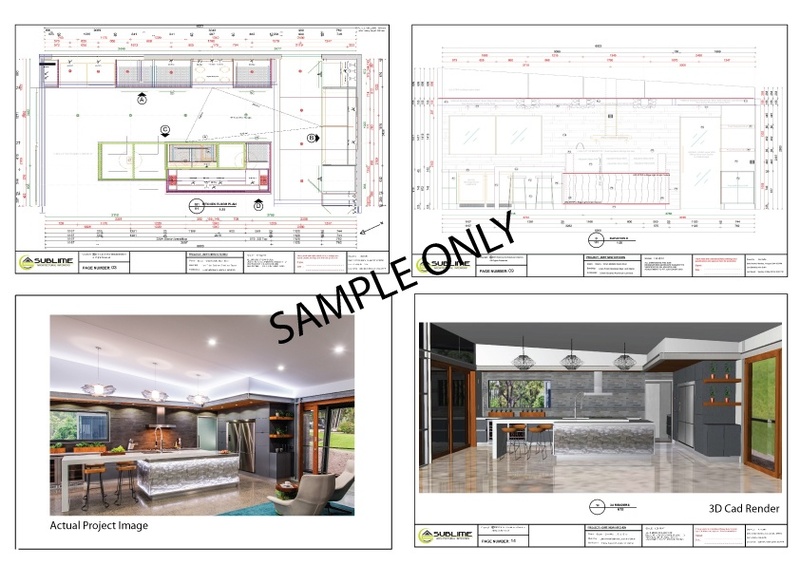 Once the design, fixtures and fittings have been finalized and contracts signed we prepare a set of fully dimensioned construction drawings for your project. We want to make sure their are no grey areas before we manufacture the Joinery for your project. Once you have signed your construction documents we will advise you of our intended onsite start date. WHY DO I NEED TO PAY MANDORY QBCC INSURANCE ? If your home, townhouse or multiple unit dwelling is no more than 3 storeys high and the value of any proposed building work to be done is more than $3,300 (including labour and materials) then in Queensland mandatory QBCC Home Warranty insurance must be paid within 10 days of your contract being signed. Make sure you do a QBCC licence search on your principle contractor!! DO YOU MANUFACTURE YOUR JOINERY IN HOUSE OR OUTSOURCE ? We endeavour to manufacture our joinery INHOUSE at our Sumner Park Workshop. We take great pride in our manufacturing processes and our past clients will attest to our quality workmanship and skill of our highly qualified, experienced and skilled tradesmen. We invite and encourage you to inspect your cabinets at our Sumner Park Factory prior to installation in your home. It is important to us that you are satisfied with the final product and how things will look and feel prior to leaving our factory for installation. Kim will meet you on site on the very first day. He will run through the expected timeline for your project. Kim will update you regularly on the progress of your project. Providing you with information (sometimes daily) on who will be in attendance and what will be completed when. As your project manager, Kim will liaise with all trades required to complete your project. He will answer any questions that the tradespeople have so you don’t have to worry about something not being completed as per plan or requirements. Kim will meet with you to review your completed kitchen or bathroom, provide you with a warranty or manufacturer information as well as care guides so you can get the most out of your space for many years to come.